The building and repair work carried out by dangerously incompetent and unscrupulous builders, often known as “cowboys,” is widely reported in newspapers and investigations into their nefarious activities are popular and thought-provoking television documentaries. This publicity helps to warn the unwary of the misery, unjustifiable costs and even death that can result by employing unskilled building workers to carry out improvements and, often-unnecessary, repairs to their homes. These Black Hatted Cowboys will always ask for “cash-up-front” before he starts to work. Later, he will ask for more cash, because he “under-estimated the work and material needed to finish the job”. If the householder is unable or unwilling to part with more money, the cowboy will leave the property in such a state that it is an unsafe dwelling. 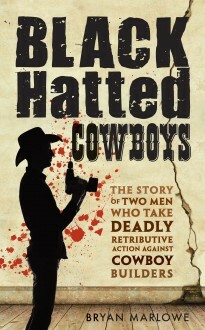 Black Hatted Cowboys tells the story of two men who are prepared to take deadly retributive action against cowboy builders.